MLB's latest replay review proposal is a 30-second time limit for manager delay, or 'hold' strategy, that has been used by teams deciding whether or not to challenge an umpire's call since expanded replay made its 2014 debut. 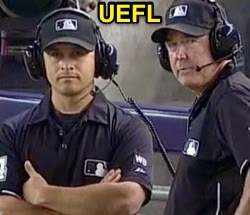 Similarly, a two-minute "guideline" for Replay Officials in MLBAM's New York Replay HQ is also under consideration, although sources say that often times the definitive angle or slow-motion replay is not immediately accessible to the umpires in New York, and sometimes only arrives at MLBAM after the two-minute mark. According to an ESPN report, Major League Baseball has been in talks with the umpires' union (World Umpires Association) concerning its latest effort to improve pace-of-play and reduce game times. Sources familiar with the situation said that introducing a 30-second time limit for managers to decide whether or not to file a Manager's Challenge is but one of several potential changes to replay under consideration. 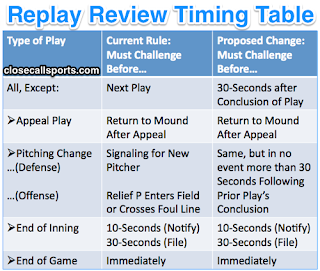 Because inning-ending, game-ending, and pitching change-related challenges already are subject to their own unique restrictions regarding review timeliness, timing for these situations would likely stay the same. For instance, managers must exercise their challenge on game-ending plays "immediately" upon the conclusion of such a play, a lesson Reds skipper Bryan Price learned all too well in late 2016, when he failed to challenge Cardinals batter Yadier Molina's walk-off hit that scored game-winning baserunner Matt Carpenter from first base. Replays indicate the ball bounced out of play such that R1 Carpenter would likely have been placed back at third base had the play gone to Review. Bryan Price wants more pre-review time. Price told reporters that by the time his ball club had completed its own internal review of the play, and decided to exercise the Manager's Challenge, the umpires had already left the playing field pursuant to Replay Regulation II.D.1 ("A challenge to a play that ends the game must be invoked immediately upon the conclusion of the play, and both Clubs shall remain in their dugouts until the Replay Official issues his decision"). Because he failed to notify umpires immediately, the game was declared over. Similarly, inning-ending challenges are subject to the following guidelines: First, within 10 seconds of the conclusion of the inning-ending play, a manager must run onto the field and notify an umpire that the team is considering filing a challenge. Second, within 30 seconds of the manager's entrance onto the playing field, a final decision must be given. If the manager fails to abide by the 10- and 30-second time limits, the umpire may deny the challenge request. MLB's current proposal effectively would take the end-of-inning's 30-second time limit and expand that restriction to all other 'ordinary' replay review situations that might occur during a game. Insofar as delay of game is concerned, the present regulation states that "on-field personnel may not intentionally delay the game in order to provide their club with additional time to challenge a play." Managers may not personally access video in the clubhouse (although they may speak with a coach or video coordinator who has access to the video replays), and umpires may warn teams if they feel the team is delaying its review: there is presently no time limit attached to any of the review regulations other than those described above. Data from 2016 indicates the average review took one-minute and 36 seconds to complete, compared to 1:51 in 2015 (a 15-second decrease), with umpires spending just 1:10 on their headsets awaiting NY's decision, compared to 1:27 in 2015 (a 17-second decrease). In 2015, only 5.3% of reviews took over three minutes to complete, and 1.2% took four minutes or longer.